Of course we get ridiculed, tortured and killed anyway. . . . This entry was written by whyevolutionistrue and posted on June 1, 2015 at 11:44 am and filed under atheism. Bookmark the permalink. Follow any comments here with the RSS feed for this post. Both comments and trackbacks are currently closed. Ah, the compelling power of “personal experience” … burdened as it is with observer-relative confirmation bias. The main purpose is to put the blame squarely on them that can’t see it. This is why Dawkins has proposed that “doubting Thomas” should be the patron saint of scientists and rationalists – notwithstanding his portrayal as flawed apostle in the Bible. There are other reasons not to kill or torture someone. Such as it being immoral to do so. Hmm. I never thought of that. Apparently a lot of people never thought of that until the Enlightenment. It is depressing. And, of course, darkly comically ironic that at the same time Christianity claims the moral high ground. The only moral ground, actually. As do other major religions, but especially the desert dogmas. I’d be willing to bet the proverbial farm that the folks at American Atheists (I think?) are well aware of the moral reasons for not killing or torturing people. Their point is that many theists *do* resort to violence, which is tragically ironic because if the theists were right, and good evidence were available, their perceived need for violence would evaporate. 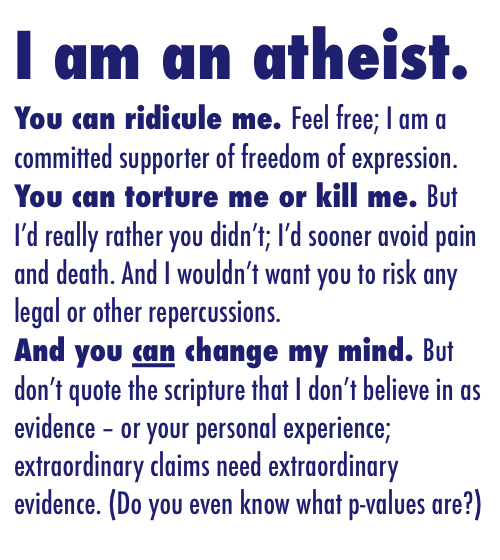 2) an attempt to shame theists into realizing that violence is not a legitimate way to settle any kind of disagreement. I think this poster assumes most people understand why torture and murder are immoral. I doubt they had a deep point, beyond just to offer pointed commentary on the earlier poster. They included the ridicule/torture/kill lines simply because the previous poster did. That is also the martyrdom thing. Saints of yore: Tortured and didn’t recant, blah, blah, blah. Your ‘nym. I see what you did there. You come across (or come up with yourself) these succinct arguments or points that really don’t need any improvement, and you think “that should be checkmate”. I say “should” because, frustratingly and depressingly, theists always manage to miss the point and mistakenly think the argument continues. In this case, I can hear all my theist acquaintances replying “there’s lots of evidence”, because they don’t understand how evidence actually works. Ah — see my response under #2. But what if you have no evidence? Back to torture it is! Torture is easier anyway. Evidence takes time and work. The hard kind of work, cognitive. Christians will say they don’t need evidence all the need is faith. and we go in circles over and over…..
To respond to threats of torture with “I’d really rather you didn’t” sounds very British, if you don’t mind me saying. If there isn’t a t-shirt, why not? If there is a t-shirt, may I have the source so I can purchase a LOT of them…! It would be easy enough to make. I have a creators account on Zazzle. The prices for the shirts won’t be great, but it is a custom print. I wouldn’t would think twice. First, it seems that “authentic testimony” must be defined rather narrowly in order for the thing attested to to be considered true. Bible believers think that the Gospels are “authentic testimony,” for example. On the second part, “as opposed to what is merely inferred,” doesn’t this run up against how we “know” evolution is true? It may seem obvious, but it seems to me that the fact of evolution is inferred from the evidence of the fossils as well as genetic similarities among species, etc. It’s not possible to observe an ape evolving into H. sapiens, but we infer from the evidence that it happened. So I’m not sure exactly what that last part means. I suspect they meant for “merely” to be a qualifier to “inferred”, on grounds that one can make incorrect inferences sometimes. But it could have been clearer. It’s also possible some editor who is also an Anglican priest stuck those parts in there. I’m sure all the OED definitions are reviewed before being allowed in. It’s the closed minds that’re the smallest ones. I have to admit that I’ve been pretty open and I’ve never had a problem. Then again I live in the US and am a professor (small college) and atheism is just a “normal” position to hold. I thought the religious one was mostly stupid and the point of it only makes them look stupid. Making a joke of it is one way to handle it but I would pass on the Atheist sign because mostly they will not get it. Copying the crazies is usually not a good way to look sane. It was a minor bone of contention in the Protestant Reformation that Catholicism had falsified the meaning of the word by simply identifying it with going to confession and doing penances. The Reformers (Martin Luther and John Calvin) objected, pointing out that in Greek it really meant changing your mind, your whole way of thinking. The term has since been appropriated by psychologists such as R.D. Laing and Carl Jung. Either way if you have abandoned any sort of religion for secular humanism, you have definitely undergone “metanoia”. That was interesting. I’ve often wondered if we get the full meaning of such words (see also akrasia, ataraxia) because the language, time and culture are so displaced from our present ones. Vocabulary stultified by layer upon layer of sophisticated piety. I appreciate the sentiment but this does rather read as if it is OK to torture people to try and change their mind! But please don’t. You can change my mind with evidence and reasoned debate. Not quite as pithy, I know. Given that the evidence is admittedly insufficient (it needs faith!) then oh darn, it looks like they’ll have to revert to the default. I think the symbol used here is interesting — the universal/circle atheism symbol with some added atomic stuff from the American Atheist logo. While I’m a purist myself (as seen by my atavar) I’m seeing this variation more and more. It’s a bit more complicated to draw, but it does look nice. It is ironic that “Atheism,” as PRACTICED resembles religion so much. A-theism is different. Unfortunately, for many religionists, the second alternative is kinda difficult, and anyway the first alternative is what comes naturally to them and they enjoy it so much more. The one I’ve noticed from theist apologists recently is that the problem is that the “new atheists” aren’t open to evidence. Of course they won’t show what the evidence is, but simply accuse the “new atheists” of not being open to the possibility. It’s a strange sort of argument. You’d think the best way to refute the “new atheists” is to show the case for God. Instead, we get the possibility of a case, or the need for open-mindedness to the possibility of a case. Where’s the actual case?